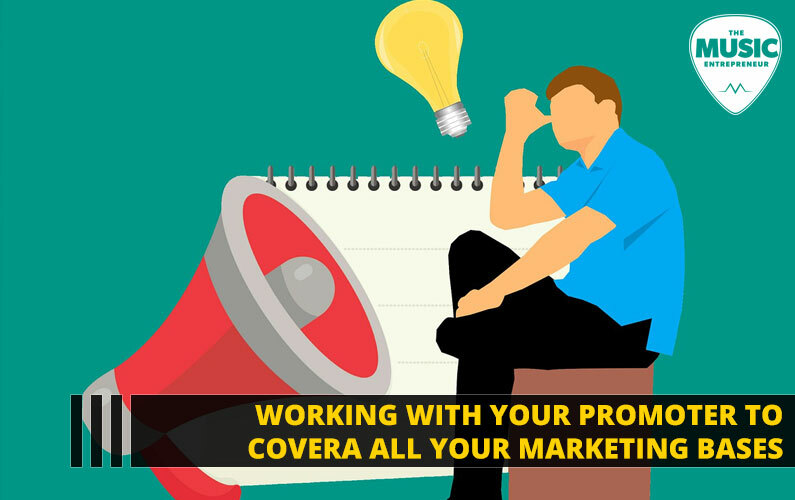 Are you thinking about working with a promoter? Then you’ll love the insights shared in this guest post via Avery Phillips. By the way, if you think you have something worth sharing with the community, you can find our submission guidelines here. Establishing a fan base is essential to building a music career. There’s a lot of hard work that goes into writing and recording songs, so it’s only natural that musicians would want to get their music out to as many people as possible. So, how do you get your music in front of people? Working with a promoter can be a good way to determine the best course of action moving forward. You should be aware, however, that professional promoters generally like to work with established musicians. If you’re just getting started, you may want to look for independent business owners who are looking to grow their client base and portfolio. A promoter can help you gain access to an audience you might not otherwise be able to reach. Oftentimes, they have extensive experience in marketing, in which case you can tap their knowledge for a cohesive marketing plan. As ASU puts it, “a marketing director’s day can usually be separated into management and strategy. You manage both people and processes as you work cooperatively to develop pricing strategies, promotional plans and advertising campaigns.” In many cases, their understanding and expertise will far exceed yours. But what if your promoter doesn’t have your best interests in mind? Or, what if they don’t fully understand the direction in which you are trying to take your music and branding or image? To make sure you feel comfortable bringing on a prompter for your marketing efforts, it helps if you actively work with them in marketing your music. Let’s get into how you can work with a promoter to get the best results possible. If you’re just getting started in music, you probably aren’t making much money. That being the case, you’ll want to form a marketing campaign that’s easy on the wallet and helps you get the maximum results based on your limited resources. This is where social media comes into play. Marketing via social media offers networking opportunities, brand awareness (band awareness), and increased visibility. Take a look at any major social media platform and there is a high chance that your favorite musician has a presence there. Many musicians make the effort to develop a strong social media presence because of its advantages in marketing their music, upcoming shows, and communicating with their audience online. In addition to increased visibility, it also creates a lasting brand loyalty that will help you retain your fans. Work with your promoter to engage your social media followers. They can help you be seen by influencers and decision-makers, and help you reach a broader audience. Additionally, a post from a promoter can put some credibility behind you. Your image may be the most significant driving factor in your marketing. You may be a musician, but if you aren’t a memorable musician, then you will be just another one of the countless others who are trying to find their fan base. Additionally, a record label may be more apt to sign you if you’ve got your marketing sorted out — meaning all they have to do is market your image, not create your image and market it as well. Especially in the social setting that is the marketplace, we subconsciously rely on our instincts to validate our decisions to be loyal customers of this brand as opposed to that one. What creates these emotional ties to material things? Most of the time the emotional value that a consumer associates with a company is created directly from their perception of the company’s appearance, which is the vehicle through which we perceive value, quality and the like. Work with your promoter to craft your image. Or, help your promoter understand your image so they don’t try to take it another direction, or book shows in venues you’d rather not play. In many instances, a musician wants full creative license over their image and brand. But this can hurt you instead of helping you, especially if you don’t understand how you’re coming across to your audience. Either way, have a talk with your promoter to ensure they fully understand how to market your brand in a way that’s congruent with how you want to be perceived. Playing a local festival is a great way to get your name out there and gain new fans. Many festival-goers go to see a couple of their favorite musicians and end up enjoying many other bands they see on stage. Others go to festivals with the sole purpose of discovering new music. This is an excellent opportunity for you to gain new fans, as well as connect with other local musicians. Networking with other musicians whose music pairs well with yours and collaborating with them can make for some great content or performance opportunities later on down the line. Your promoter should know how and where to get a hold of your local festival organizers, and you should be in talks with them to try to get a spot. And, as always, you and your promoter show promoter your appearances at festivals. As a new musician, it may be enticing to play every show you can get. This may be against your best interest, however, as some venues don’t treat or pay you fairly, and many venues aren’t a good fit for your music. For example, your folk music may be great, but it might not be appreciated at a death metal or rap venue, especially alongside other musical acts fitting said venues. Talk to your promoter to ensure they understand your music and where it would fit for a great show, and showcase your music correctly. Furthermore, a promoter should negotiate an appropriate price for your time and efforts. For best results, do some of your own homework and research the place before you play there. In many cases, reviews are available online to see if a venue has unfair practices including not paying the musicians. Your promoter should use their networking, marketing, and business skills to act as an ambassador for your music. However, that doesn’t mean that you have no say in the matter. Take what you’ve learned and work with your promoter to get you started the right way — establishing a fan base, playing quality shows, and preventing venues from taking advantage of you.